Brigadier General Carmelita Vigil-Schimmenti (born December 16, 1936) was an officer of the United States Air Force, who in 1985 became the first Hispanic female to attain the rank of Brigadier General. Vigil-Schimmenti was the Chief of the U. S Air Force Nurse Corps, Office of the Surgeon General; Headquarters U.S. Air Force, Washington, D.C.
Vigil-Schimmenti was born in Albuquerque, New Mexico, where she lived at her family's ranch between Edgewood and Moriarty. She graduated from St. Mary's High School in 1954. In 1957, she received her nursing diploma from the Regina School of Nursing of Albuquerque. Vigil-Schimmenti joined the U.S. Air Force in 1958 and was assigned to the Air Force Nurse Corps. From August 1958 until September 1960, she served as an operating room nurse and general duty nurse at the USAF Medical Center Wright-Patterson, Wright-Patterson Air Force Base in Ohio. During the time she served at the USAF Medical Center Wright-Patterson, she was able to complete the flight nurse course at Gunter Air Force Base in Alabama. In 1960, Vigil-Schimmenti was assigned as a general duty nurse at USAF Dispensary, Hickam Air Force Base, Hawaii, where she served until May 1962, when she was transferred to the 9th Aeromedical Evacuation Squadron, Tachikawa Air Base, Japan, where she was a flight nurse until August 1964. In August 1964, Vigil-Schimmenti left to attend the University of Pittsburgh and earned a Bachelor of Science degree in 1966. In July 1966, she was assigned to the USAF School of Health Care Sciences, Sheppard Air Force Base, Texas, as an instructor in the Medical Service Specialist Course. Vigil-Schimmenti served in the Pacific during the Vietnam War. In June 1968, Vigil-Schimmenti, was named the charge nurse in the school health program and primary care screening nurse at USAF Dispensary, Kadena Air Base, Okinawa. In January 1971, she returned to the United States and was assigned to David Grant USAF Medical Center, Travis Air Force Base, California, as charge nurse emergency services and primary care clinic, charge nurse oncology clinic and home care service. Vigil-Schimmenti attended the University of North Carolina, Chapel Hill from August 1973 until August 1974 and earned a Master of Public Health degree. Following graduate studies, she was transferred to Wilford Hall USAF Medical Center, Lackland Air Force Base, Texas, where she served as charge nurse, clinical coordinator and facility design coordinator. 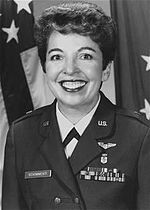 Vigil-Schimmenti served in various positions until March 1983, when she was selected as command nurse, Headquarters Strategic Air Command, Offutt Air Force Base in Nebraska. In October 1985, Vigil-Schimmenti became the first Hispanic female to attain the rank of Brigadier General. She assumed the duties of Chief of the U. S Air Force Nurse Corps, Office of the Surgeon General; Headquarters U.S. Air Force, Washington, D.C.
Vigil-Schimmenti retired from the Air Force in 1988 and returned to Albuquerque with her husband, retired Marine Lieutenant Colonel Joseph A. Schimmenti. During her service years she attended the Air War College and the Inter-Agency Institute. Vigil-Schimmenti is a member of the American Nurses Association, Texas Nurses Association, Association of Military Surgeons of the United States, National League for Nursing, Air Force Association and the Aerospace Medical Association. Air Force Longevity Service Award Ribbon with five oak leaf clusters. ^ a b c d e f "U. S Air Force". Archived from the original on 2010-04-13. This page was last edited on 9 September 2018, at 05:06 (UTC).